I woke up in Oregon ready to escape the next wave of Nature's snowy wrath. After some careful arranging and leaving behind some large items, we were able to fit everything in the car. I practiced putting on the tire chains, just in case. We took one more joy ride through downtown Eugene before we hit I-5 South. The snow-covered land between Oregon and Redding, CA is some of the most beautiful I've ever saw. The highlight of the breathtaking drive was probably Mt. Shasta National Park. Mt. 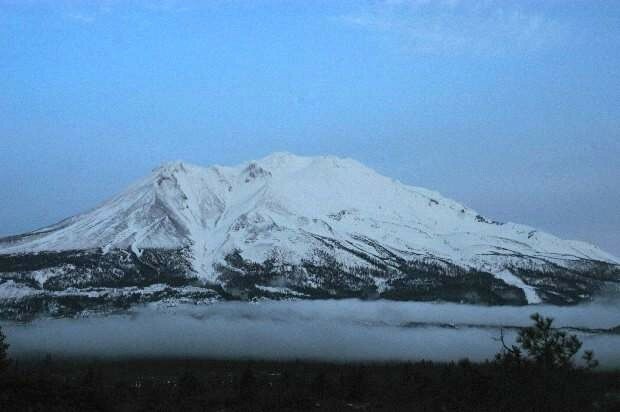 Shasta's elevation is 14,162 ft and one of the few places that rivals Yosemite. [We stopped for a bite to eat in Yreka, CA at a little joint called Grandma's House. How could they do this?! They slandered Grandma with bad cooking and poor service. Then the bill came ... Grandma must be senile too.